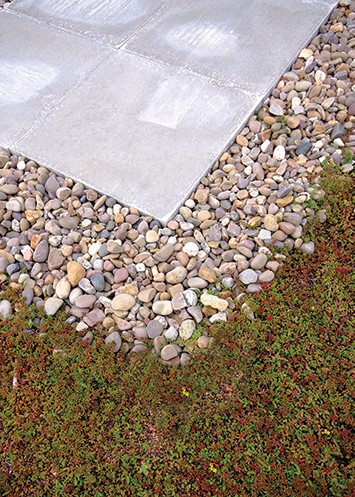 The expansion of towns and cities has seen exponential use of impervious surfaces, resulting in artificially high rainwater runoff rate, posing new challenges to the construction industry. The lack of natural infiltration and incapability of the existing drainage systems to deal with the volume of rainfall is resulting in increased instances of flash flooding and standing water. This has prompted the introduction of Sustainable Urban Drainage System (SuDS) legislations by local authorities. New developments in built up, flood sensitive areas are now required to incorporate some form of SuDS to obtain planning permission. As Malcolm Wearing of CRM Rainwater Drainage explained, SuDS options are limited with a blue roof being, in most instances, the most efficient and cost-effective solution. Bauder has originated a Blue Roof System which will simultaneously attenuate heavy rainfall and manage its discharge over a 12-24-hour period. The key component is a flow restrictor which comprises of a plate and an accumulation pipe. The plate is drilled with calculated holes that control the flow of water whilst ensuring the additional weight load is supported by the structure. The accumulation pipe manages the water volume in the case of a one-in-a-hundred-year storm event whereby it will drain the water from the roof at a much quicker rate. 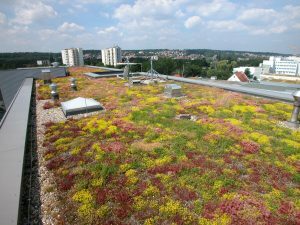 The BauderBLUE roof will limit water egress to 5-10 litres per second per hectare, the same flow rates for regional greenfield sites. Each BauderBLUE roofing solution is unique, as calculations for the flow restrictor are specific to each project to ensure that the water run off during storm conditions meets drainage requirements of local planning authorities whilst controlling the time it takes to disperse the water.